Marching Music's Major League met Major League Eating yesterday at the first-ever Drum Corps International Peanut Butter & Jelly Eating Championship. Hundreds of fans gathered to watch this new eating event that served as a kick-off to this year's Drum Corps International World Championships at Rose Bowl Stadium. "We set out to use this new event as a fun way to reach people who might not know about Drum Corps International," said Drum Corps International's Bob Jacobs, the driving marketing force behind the contest. "Expansive media coverage of the competition really helped us to reach an even larger international audience yesterday." Nine local and international media outlets attended the event including the Associated Press, local television affiliates and a Dutch television host who actually participated in the contest to air as part of his show, "Try Before you Die." 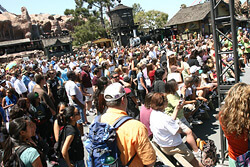 Pacific Crest kicked-off the Peanut Butter & Jelly Championship at Knott's Berry Farm amusement park in Buena Park, Calif. parading through the large surrounding audience while giving them a taste of the powerful sounds of drum corps. Once their stand-still performance ended, 16 brave competitive eaters – three of them that are ranked in the elite top 10 of Major League Eaters – were individually announced and brought to the stage for the main event. 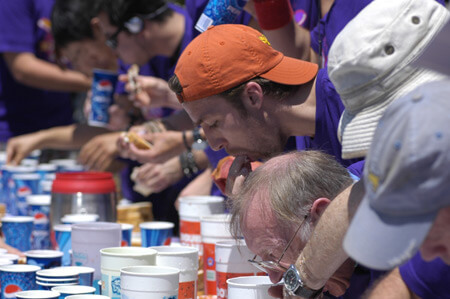 Pat Bertoletti, the third-ranked Major League Eater, won the competition and established a record for this first annual event, devouring a grand total of 42 peanut butter and jelly sandwiches in 10 minutes. Tim "Eater X" Janus earned the silver medal by eating 37.5 sandwiches and Rich "The Locust" LeFevre came in third, putting 34 PB&Js under his belt. Tim "Eater X" Janus wolfs down one of 37.5 PB&J sandwiches. "It feels really good to win the first-ever Peanut Butter and Jelly Eating Championship. I grew up on the stuff and I'm glad there's finally a contest in this now," said 22-year-old Bertolli. "I used to play tenor saxophone, my sister's a drummer and a couple of my friends are in drum corps so I think it's awesome that [Drum Corps International] started this new event." Professional chefs prepared the more than 400 peanut butter and jelly sandwiches for the competition using the Major League Eating standard of one tablespoon of peanut butter to two tablespoons of jelly on white bread for each sandwich. Michael Castellano, Ambassador of the International Federation of Competitive Eating and official emcee of the intense competition, also was excited about the new event's success. He was glad to have the opportunity to work on a new contest with Drum Corps International and is already brainstorming ideas for next year's event. "This entire experience has been fantastic and the contest seems so appropriate to do with Drum Corps International. They're actually the first musical sponsor we've ever had," said Castellano. "Peanut butter and jelly is a favorite amongst almost everybody in the world as it's very recognizable. Because of that, I think this contest is really something that many people will come out to see in the future." The significance of peanut butter and jelly sandwiches is obvious to corps members as the sandwich is a staple on any drum corps tours. Over the course of a typical season, top Drum Corps International units will feed their combined 5,000 performers and staff members a whopping 1.2 million meals on the Summer Music Games Tour, including 42,500 loaves of bread, 20,000 lbs. of peanut butter, and 25,000 lbs. of jelly. The innovative competition was also a huge hit with audience members who cheered throughout the event for their favorite competitive eaters and who seemed to have earned a new interest in these two combined activities. Many of them too are now looking forward to the next unique dose of PB&J from Drum Corps International. "The competition today was great and was very entertaining. I'm really glad I got a chance to see this," said Ashleigh Carpenter, 20, from Utah. "I personally like it better than the hot dog idea and I would definitely go to next year's competition." With a strong World Championships week kick-off yesterday at Knott's Berry Farm, the Drum Corps International Division I World Championships are now ready to start full-force today at Rose Bowl Stadium in Pasadena, Calif. If fans of this brand-new contest are still hungry to see people powering-down PB&Js, they can go always to their favorite corps' food truck during meal time. View a photo gallery of the Peanut Butter and Jelly Eating Competition.